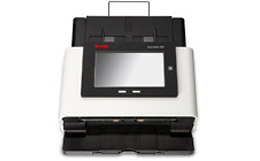 The Kodak Scan Station 500 is designed as a walk-up capture station that requires minimal user training and is easy to use. 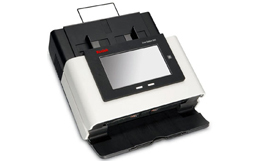 The Scan Station 500 is a standalone solution, requiring no host PC or application software. It works with an existing network and makes use of existing network shared services to communicate with other network devices or destinations. The color touch screen is easy to use and allows you to quickly send your documents via email, fax, to networked drives, networked printers or USB flash drives with a simple touch. Kodak's exclusive Voice Attachment feature gives you the option to record and send essential directions with your documents. With one scan, send a document to the network, to e-mail, to a printer, to a fax, to a USB drive, and to FTP locations simultaneously! With one scan, send a document to the network, to e-mail, to the printer, to fax, to a USB drive, and to FTP—simultaneously! ISIS and TWAIN Drivers, WIA Drivers, Kodak Capture Desktop Software, KODAK Smart Touch, Nuance PaperPort. Physical dimensions 15 x 34.9 x 13.8 "